When we took over the Twitter offices nine months ago, we wanted to leave a little Twitter legacy while also making it a place of our own. The embossed birds on the conference room doors is all that’s left of Twitter’s life here (other than the great karma that still surrounds), and our takeover is now in full effect. We figured the best way to make this office truly ours and to show what we strive to achieve as a company, was to put an enormous email management machine in the lobby. 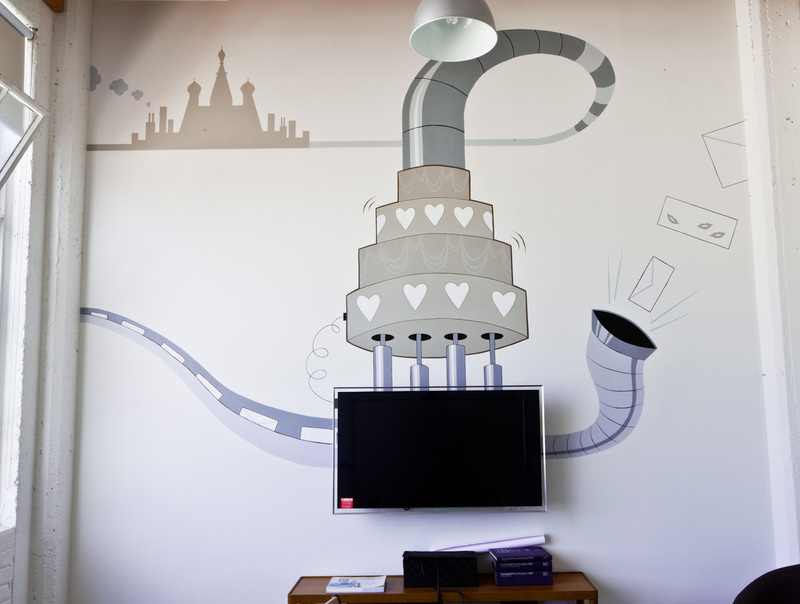 Ok, maybe not an actual machine… but a mural of one. 1) We were looking for a Seuss-ian feel to bring the sense of wonderment to our office (growing up in the 60’s/70’s/80’s leaves us all with a soft spot for Dr. Seuss). 2) We wanted to have a little fun with some popular Internet clichés and sensations over the years – i.e. “series of tubes” (Thank you former Senator Ted Stevens, formerly head of committee to regulate the Internet). 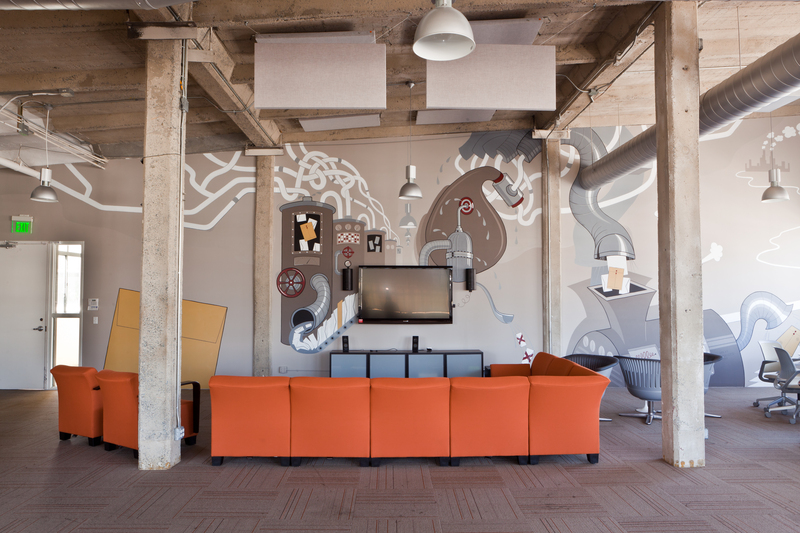 3) We also wanted to integrate the industrial office elements (exposed pipes, pilars, etc.) into the mural itself. 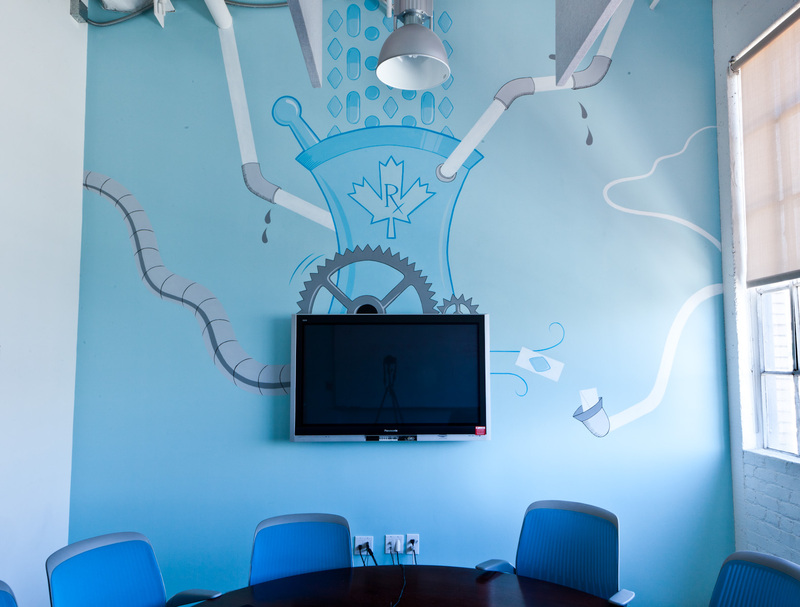 To put the finishing touch on the mural, we created a video to play on the flat panel… This turned our creative piece of art into a moving, working productivity machine. See the connection to Xobni? And that’s not all! 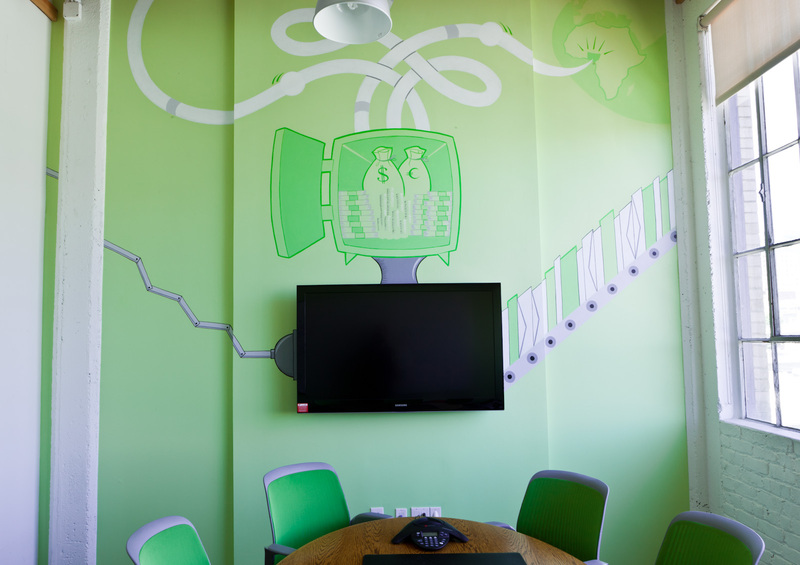 We had more walls to play with and thought it could be creative to theme all of our conference rooms with popular, but cliched form of email spam. We carried over the Dr. Seuss theme, with each room focusing on the three top internet scams that have plagued the “intertubes.” These pieces are appropriately titled “Cheap Meds,” “Mail Order Brides,” and “Money Laundering.” The beauty of these pieces is that we’re creating videos to go on each monitor that also brings these pieces to life and ultimately the scam is captured by the email machine.